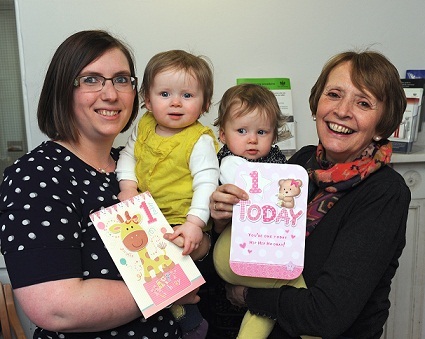 A special set of Shropshire twins have recently celebrated their first birthdays. Isabelle and Evelyn Jones were born either side of midnight last March – making the girls pretty rare. Mum Hannah Jones, a part-time office administrator at Wace Morgan Solicitors in Shrewsbury, explained that she wanted to have the babies naturally, despite most twins being born by caesarean section. “This meant that it was much harder to plan when the twins would be born and as I was induced this made it a much longer process than I expected,” said Hannah, who gave birth at the Royal Shrewsbury Hospital with husband Lee at her side. Isabelle Amelia was born on March 15 2013 at 11.35pm weighing 4lbs 8oz and Evelyn Elizabeth was a breech birth so she took a little longer – arriving feet first at 12.10am on March 16th weighing 4lbs 13oz. “I think it is unusual to have twins on separate days and so that distinction makes them extra special. “We still celebrated their first birthday jointly of course, having a little family party, and it will be a few years before I think we can explain the full situation to the girls!” said Hannah, who lives in Bowbrook and brought the twins into her office in Belmont recently to celebrate their first birthdays. Ironically Hannah shares her own birthday with her sister, Laura – but Hannah is exactly three years younger–”I like sharing my birthday with my sister, but I’m glad my twins will each get their own special day,” she added.